NSU Distinguished Alum Shares Powerful Advice for Students - Thompson Law, P.C. When Carolyn Thompson faced a cancer diagnosis and was given eight weeks to live, she believed in one powerful truth. “I believed I was going to survive and that God would have a great and mighty purpose,” said Thompson, a 1991 graduate of Northern State University. That was 2015. Today, Thompson is in remission, has published a book, and is running a successful business. As the 2018 Distinguished Alumna for the NSU School of Business, Thompson encourages NSU students to believe in their own powerful truths – to believe in themselves. Thompson – who describes herself as an entrepreneur with the heart of a teacher who happens to practice law – also empowered students to take control of their own future. A native of Parkston, Thompson said it was a high school admissions counselor visit that first sparked her interest in NSU. She was so impressed that she needed to check out Northern – and she loved what she found. She had been on other college visits, but when it came to NSU, “I just felt at home,” she said. It was a safe, small campus where she felt comfortable and felt like she could grow. “NSU just really gave me a great foundation to get my core education and then dream big,” she said. At Northern, Thompson took a business law class taught by Professor R. James Krueger, which got her interested in law. Accounting Professor Paul Everson also showed an interest in her career, encouraging her to obtain her CPA and go to law school, which she did. After graduation, Thompson got a full scholarship to law school, then became a partner in a well-established Sioux Falls law firm. But even before she gained the necessary analytical skills at NSU, Thompson obtained crucial communications skills by growing up working at a corner café, talking and listening to customers – and that’s where she truly found her calling. “I poured coffee for every farmer in Hutchinson County,” Thompson said. Through good times and bad, she heard a lot of stories – some that were traumatic, where families had to sell land because they couldn’t make payments due to tough financial times or poor estate planning that led to taxes and family feuds. When she got to Northern and learned about estate taxes, she knew this would be a way to help families keep their farms. In 2003, Thompson made the decision to leave her firm in order to start her own business – a difficult choice, but the right one. Thompson Law P.C., an estate and business planning law firm in Sioux Falls, strives to positively impact families, helping them leave a legacy for their loved ones – not solely in terms of financial means, but also with a reflection of the values and the beliefs that can be shared for generations to come. But on April 9, 2015, Thompson was diagnosed with a rare, aggressive form of acute myeloid leukemia, with only 40 reported cases in recorded history. She essentially went from being in perfect health one day to having six to eight weeks to live the next, and no guarantees on treatment. “Luckily, I was a woman of faith before the diagnosis with a strong foundation and trust in the Lord,” Thompson said. Like many people’s faith, much of that dependence and trust in the Lord strengthened through difficult times. This would be no exception. That August, she underwent a stem cell transplant, spending eight months in Houston. Chemotherapy made it difficult to work, but she stayed positive – and expected others to as well. Though she lives with lingering side effects – lower energy, muscle and joint pain, a weak immune system – she is now in remission, with a positive prognosis and a faith even stronger. 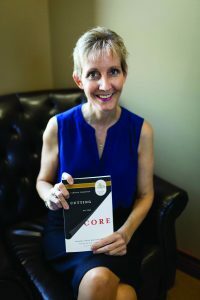 The experience led her to publish her book, “Cutting to the Core: Finding What Matters Most Through the Eyes of a Survivor in Life & Business,” in which she shares stories of faith, support and an unbeatable spirit. Now, Thompson is passionate about raising awareness and funds in the fight against leukemia. To spread the word about the national “Lemons for Leukemia” challenge she made a video and challenged NSU students, faculty and friends in the area to be tested and have their DNA registered in the national “Be the Match” registry. The “Lemons for Leukemia” challenge is similar to the ALS ice bucket challenge, but instead of raising dollars to combat a disease, it is collecting DNA from individuals who may just “be the match,” for someone with a life threatening illness. Thompson was the catalyst for the April 30 “Lemons for Leukemia” event on campus to add people to the national Be the Match registry. For her stem cell transplant, a stranger (who too was on a college campus half way across the country when he decided to answer the call to participate in the Be the Match program) was literally a perfect, 10 out of 10, match to her. So she knows first-hand the importance of people getting on the national donor database, because those closest to her – her family – were only a 5 of 10 match to her. Thompson said she was an appreciative person before she was sick, but now she is even more so. That applies to parenting, too. “When you have to FaceTime your kids for 8 months, you just see things differently,” she said. Thompson, who lives in Brandon, has three children: son Taylor, 20; daughter Rachel, 16; and son Will, 15. She said even before she was sick, she was very much into teaching her children about legacy and character, not just because of her 21 year career in estate planning, but because, she believes, it is truly the only thing, that if embodied can truly pass down and create a positive ripple effect for generations to come. That’s another truth she believes in: In your journey, it’s about the truth you believe and the people who walk alongside you that are most important. And from her rich, successful life experience, Thompson wanted to stress to students that graduation day is not the end – it is just the beginning.